I heard stories about Jimi Hendrix being so obsessed with practicing he would fall asleep holding his guitar in the bed with him. A friend told me Emanuel Ax, the great classical pianist, practices as he is eating breakfast. That’s how he starts his day. Reading an interview with the vibraphonist Gary Burton concerning his practice routine, he claimed he practiced very little on the instrument. The majority of his exercises were in his head. He would play patterns, melodies, all in his head, away from an instrument. Therefore, when at the vibraphone he had a better understanding of what to play. He had conjured ideas and was ready to put them in action. That’s how I like to practice…in my head. Too bad I can’t translate it to the instrument as Gary does! Needless to say Gary logged in many hours on the instrument. Carmine Caruso was a legendary brass teacher. He taught in NYC for many years on West 46th St and many of his students were extremely accomplished musicians looking for what Carmine had to offer. He concentrated on breath control and various horn exercises. I had a friend who studied with him. After a lesson, in his Zen state of mind, I asked, “What’s so great about your lessons, this guy doesn’t even play trumpet. My friend replied, “Carmine teaches me a different way to practice. I approach the horn differently.” Carmine was not a brass player. He was a saxophonist and the majority of his students played trumpet! So basically and ultimately it is about the music. Not just the technique. The aim of practicing is to prepare for the music to be performed. The better prepared, hopefully, the better the performance. And we have to remind ourselves to practice what we don’t know, not what we do. Athletes spend hours working on their faults to help ensure a win. 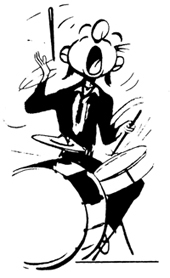 There is nothing more boring than listening to a drummer/musician with incredible chops but no musicality. Granted, we are impressed with phenomenal technique, but let me experience the music, the feeling and I’m happy! Posted on Mar.19, 2019 by dbutler in category Barry Speaks. Tagged with mel lewis. Bookmark the Permalink.